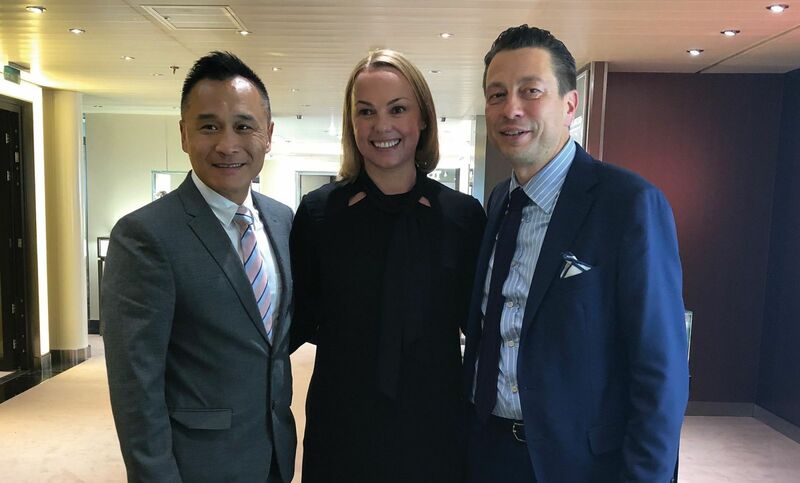 After a tour of the Costa Venezia in early March, The Moodie Davitt Report President Dermot Davitt sat down with Starboard Vice President & General Manager Cruise Retail, Asia Derek Wong (left), Senior Vice President Cruise Retail North America Carrie Julier (centre) and Vice President & General Manager Cruise Retail, Europe Stefano Menegotto (right) to talk about creating a point of difference in cruise retail. “Where we are strong is in our ability to bring new brands to the industry, helped by our DNA in luxury and by our LVMH connections.” That’s how Senior Vice President Cruise Retail North America Carrie Julier sums up what Starboard can offer brands as they consider investment in the cruise market. “We have developed a level of trust for introducing first to market products, for training our talent, for sourcing the right specialists, for creating experiences onboard that are different and for our 360-degree approach,” she adds. “We are also steeped in cruise so can tailor and customise experiences from region to region. You don’t get a cookie-cutter approach as you might at some airports for example. You get something that is aligned to the cruise line’s philosophy, something that is right for each ship. There are still opportunities to attract new brands and the company admits that some need convincing that cruise is a channel worthy of their attention. But, Julier notes, “brands who work with us are seeing the value of engagement with the guest over seven days, where we can create moments that are not possible in land-based retail, bringing them back again and again. “We can help our partners in travel retail recognise that cruise is different. Many brands still apply their land-based standards to ships but they demand a different approach. “We are challenging brands’ thinking and assumptions about cruise. We can activate the brands in appropriate ways with experiences, and that is one of our differentiating factors. We can give them a level of comfort about our treatment and build their trust. Vice President & General Manager Cruise Retail, Europe Stefano Menegotto underscores the Starboard drive to be seen as a leader in experiences, not just as a retailer. “This is very meaningful for us,” he says. “We have guests onboard for five to seven days on average. There are lots of lessons we can implement at different points of the journey from our experiences around the world. For example we are introducing fine jewellery on our Asia itineraries. It is key in the Caribbean but not really in Europe; that is an opportunity to use experiences in new ways. Starboard Vice President & General Manager Cruise Retail, Asia Derek Wong notes that retail can even add value in attracting guests. “Great retail and experiences can have an impact on ticket sales. In Asia especially people will choose a ship because of its onboard offer, or the way they brands become part of the trip. That does not happen at airports in the same way.